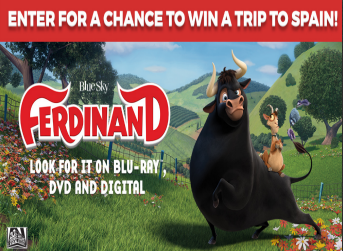 Hotels.com “Ferdinand” DVD/Blu-Ray/HD Release Sweepstakes – Win a trip to Spain! Win a trip to Madrid, Spain! ENTER SWEEPSTAKES HERE – Hotels.com Sweepstakes page. ELIGIBILITY – The Hotels.com “Ferdinand” DVD/Blu-Ray/HD Release Sweepstakes is open only to legal residents of the Brazil, Canada (excluding Quebec), Denmark, France, Finland, Germany, Japan, Mexico, South Korea, the United Kingdom, and the United States who are at least eighteen (18) years old or the age of majority in their jurisdiction of residence. SWEEPSTAKES ENTRY PERIOD – The Sweepstakes begins at 12:00 am CT on March 15, 2018, and ends at 11:59 pm CT on April 15, 2018.
a. Roundtrip, coach-class air transportation from a major international airport in the capital city of the winner’s country of residence, or from a major international airport nearest to the winner’s residence if the winner is from the United States, to Madrid, Spain. The winner and guest must travel together on the same itinerary. b. Four (4) days and three (3) nights hotel accommodations (one room, double occupancy) in a luxury hotel (to be determined by Sponsor in its sole discretion) in Madrid, Spain. The stay must include one (1) Saturday night. The winner will be required to provide a debit or credit card upon hotel check-in for incidentals. c. A VIP City Sightseeing Card, which includes admission to museums and other attractions, for the winner and guest for twenty-four (24) hours. The approximate retail value of the prize is $4,995 USD.